In Drum Blender Machine, container rotating around an inclined axis serves as a mixing tool. The rotating movement and the inclined arrangement of the container walls gives a mixing effect. Mixing, Homogenizing and dyeing of powdery or granulated components in the plastics processing, chemical, chemico-technical, food and luxury food industries, in pharmaceutical as well as in textile and leather factories. Speed of Mixer: 20 R.P.M. Approx. Electrical Service: 3 HP/1440 rpm/415V/3PH/ A.C. Supply. 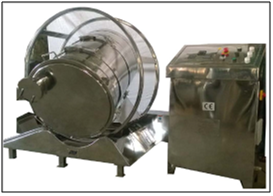 We can do Testing and CE marking for Range of Similar machineries like, Mass Mixer, Drum Blender, Octagonal Blender, and Double Cone Blender, Tablet Coating Machine and many more Pharma Instruments. Low Voltage Directive: The LVD covers health and safety risks on electrical equipment operating with an input or output voltage of between 50 and 1000 V AC and 75 and 1500 VDC for direct current. Machinery Directive: A machine is defined as an assembly of linked parts or components, at least one of which moves. Clearly this definition encompasses a very large range of machines, from simple power tools to complete automated industrial production lines. Testing is done by ITC INDIA Pvt. Ltd. as per harmonized Standard. An NABL Accredited Lab.